The focus of today's review is the miniITX, 17cm square, Gigabyte GA-E350N-USB3 AMD Fusion motherboard. This platform is based on a dual-core netbook processor from AMD called the AMD Fusion E-350 'Zacate' APU. Gigabyte kept the traditional BIOS for the GA-E350N-USB3 motherboard. 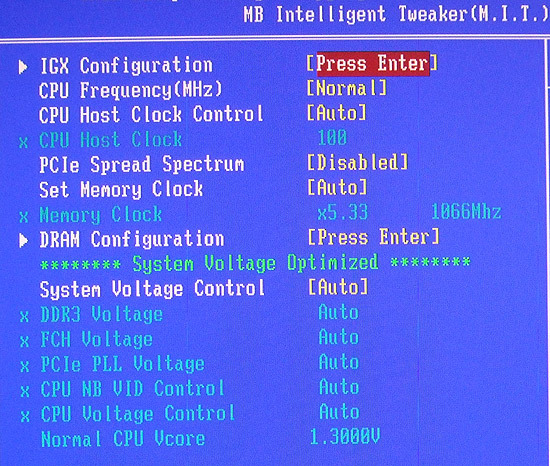 There are modest overclocking controls for adjusting the 1.6GHz AMD E-350 dual core CPU frequency and host clock in the MB Intelligent Tweaker section. 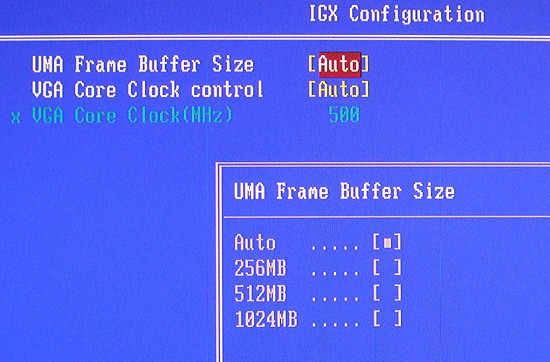 The 492MHz/80-shader processor Radeon HD6310 IGP can be overclocked, but doing so really isn't worth the time. The best performance gains will come from dropping in a discreet videocard. Up to 1024MB of system memory can be allocated to the IGP, the typical amount is 512MB. 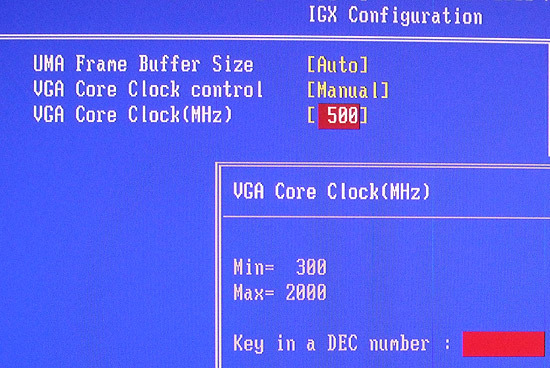 VGA clock speed can be adjusted up from ~500MHz to 2000MHz if you'd like to try your hand at IGP overclocking. 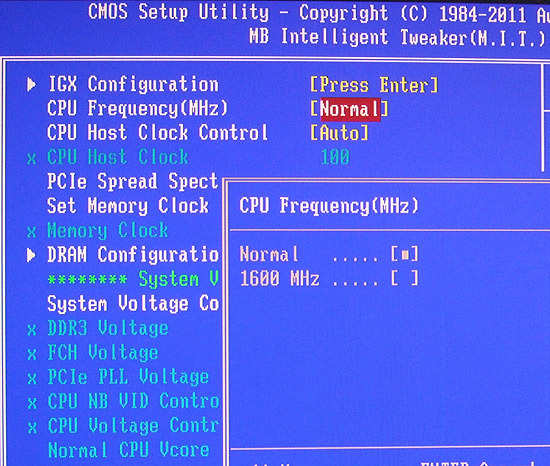 The BIOS has extensive memory control options, timings can be set down to the individual clocks cycle. 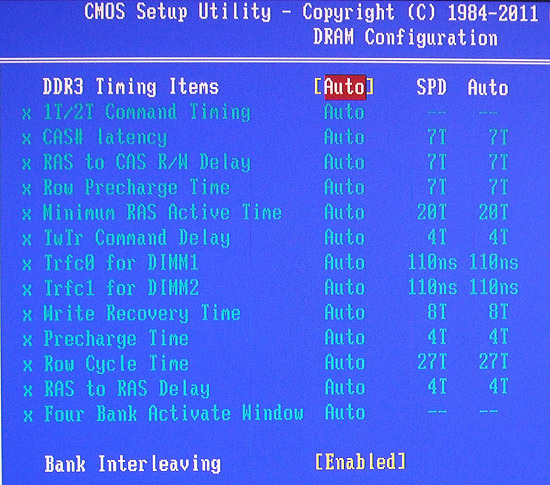 With the BIOS covered, let's move onto overclocking and the PCSTATS motherboard benchmark suite. 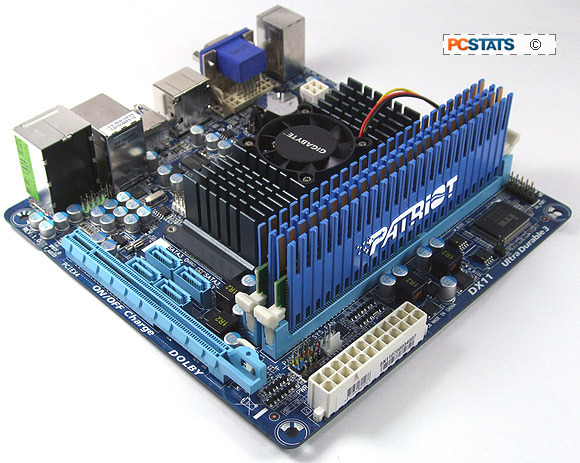 For this test system PCSTATS installed 4GB's of Patriot Memory DDR3-1066 RAM into the Gigabyte GA-E350N-USB3 motherboard. The storage device is super quick OCZ Vertex 2 SSD (120GB, SATAII). Thanks to Patriot Memory and OCZ Technology for help outfitting this test platform. Details on how the AMD A50M 'Hudson-M1' Gigabyte GA-E350N-USB3 motherboard was configured for benchmarking - including specific hardware, software drivers, operating system and benchmark versions - is listed in the Test System Spec chart below. Please take a moment to look over PCSTATS test system configurations before moving on to the individual benchmark results.